Japan's prime minister Shinzo Abe has positioned himself as an enthusiastic advocate of promoting equality in Japanese society. In a recent session of the Japanese Diet's Budget Committee, Noriko Horiuchi, a member of Mr Abe's Liberal Democratic Party, credited the prime minister's championing of women's advancement as a factor in "the beginning of a new era in female success". Does that claim stand up to scrutiny? 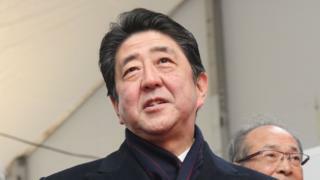 A key part of his policy of economic reforms, dubbed 'Abenomics', involves getting more women into the workforce; and the term "womenomics" has been used to describe this aspect of his politics. But despite this rhetoric, Japan has actually slipped in the World Economic Forum's (WEF) global ranking of the gender gap - dropping from 111th in 2016 to 114th in 2017. Ten years ago, it ranked 80th. The WEF index is derived by looking at several different areas where a gender gap might occur; one of the key ones being economic participation and opportunity. In the Budget Committee meeting, Mr Abe claimed that over the last five years, the female employment rate had risen, and that it was now higher than that of the United States for women over 25 years of age. The number of female employees in the workforce has increased since 2012 - and according to 2016 OECD figures, Mr Abe is also correct in saying that the employment rate of women is higher than that of the United States for those who are over 25. In 2016, Japan's overall female employment rate of 66.1% was well over the OECD average of 59.4%. However, Atsuko Muraki, visiting professor at Tsuda University and a former vice-minister for Health, Labour and Welfare, says female employment in Japan has increased in quantity but not in quality. This is borne out by a closer look at the type of work women are doing - only 12.4% of legislators, senior officials and managers are female, according to the WEF figures. Mr Abe's government enacted a law aimed at achieving gender equality in the workplace in 2015. It made companies with more than 301 employees set targets for increasing women in management and publish their results. However, there are no penalties for failing to comply. Is Japan's plan for more women in the workplace failing? In 2016 the government revised an ambitious national target of filling 30% of senior positions in both the public and private sectors with women by 2020. The new targets were 7% for senior government jobs and 15% at companies. The main reason for Japan falling down the rankings in the WEF's index was "reversals of progress" in political empowerment. Mr Abe's 2014 cabinet was noted for equalling the highest number of female Cabinet ministers ever in Japanese history (seven out of 18). However, his current 20-member Cabinet has only two women in it - justice minister Yoko Kamikawa and Seiko Noda, whose brief covers internal affairs, women's empowerment, and social security. Only 47 out of 465 lawmakers in the House of Representatives are women. Percentage-wise, this is the lowest level in the G8, and also lags behind other countries in the region like South Korea, Indonesia and China. Mariko Bando, president and chancellor of Showa Women's University in Tokyo, says the political system is partly to blame, but says it is also the responsibility of the country's political parties. Japan elects its members of parliament in two ways; 289 members are chosen in single-seat constituencies by plurality, and the remaining ones are elected in block districts by proportional representation. "The political parties don't put female candidates at the top of the list in the proportional representation system," she says. "First of all political parties themselves have to do more to make efforts to encourage women's participation."